Ever since we found out about Nino’s heart condition, I’ve listened to love songs with a different set of ears. A broken heart takes on a totally new meaning when you’re concerned with the actual anatomy. If love alone could heal, our baby boy would be better than brand new, but the reality is that the way to mend a broken heart is open heart surgery. Last week we were finally given a date of Wednesday 13th April for Nino to be admitted, so if you’re the sort for sweet thoughts, prayers or positive vibes, we’d more than appreciate any you can send over his way. I don’t think I’ve talked about the origin of Nino’s name before. It’s something people often ask us in a way they wouldn’t if he was a James or a William, and the story – I think – is a sweet one to share. Up the road from my parents house in Italy is a plot of land where a local family lives, along with their various crops and animals. Several years ago, whilst out in the fields, the daughter discovered a wild boar piglet who had been abandoned by his mother. The family decided to take the baby boar in and nurse him back to health, letting him live in their house and feeding him from a bottle. Fast forward a year or so and with the boar clocking in at the weight of a small woman (fully grown they can grow up to 90kg, with tusks! ), they decided it was time to release the boar into the wild. The family duly drove him along the wiggly roads to a secluded part of the mountains, said their goodbyes and drove away. By the time they got home, the boar was already back. After a couple more attempts to liberate him, it became clear that this particular boar was a little too domesticated – he was more than happy with human company, big bowls of animal pasta (this is a thing in Italy, which makes me incredibly happy) and a daily lullaby (the family sing this to him while scratching his back with a stick) thank you very much. So they built him a pen on the land where he lives to this day, wagging his tail in greeting to any passer by, eating food from your hands and thundering across the field when he hears his name. His name, as you’ve probably guessed by now, is Nino. When Luke and I first heard it all those years ago, before we were even married, we fell a little bit in love and decided that if we were lucky enough to have a son at some point in the future, we’d like to name him Nino. And now here he is, our own little Nino bambino, named after a handsome Italian boar and as wild and wonderful as can be. Nino is also, not coincidentally, short for Antony in Italian, which was my maternal grandfather’s name. Oh and a ‘panino’? That’s Italian for ‘little loaf’, which is rather lovely too. Speaking of little loaves, ours isn’t entirely enamoured of his Moses basket of late, preferring to fall asleep in my arms or strapped to my chest, so simple dessert recipes are the order of the day. 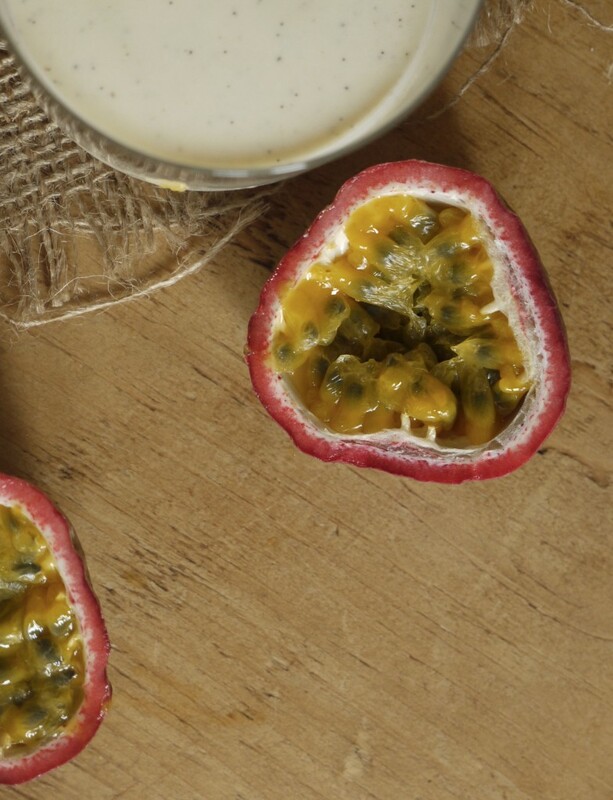 These little panna cottas are the perfect make-ahead pud, tangy with Greek yoghurt, tart passion fruit pulp and a background creamy sweetness. I hope you enjoy them as much as we did. 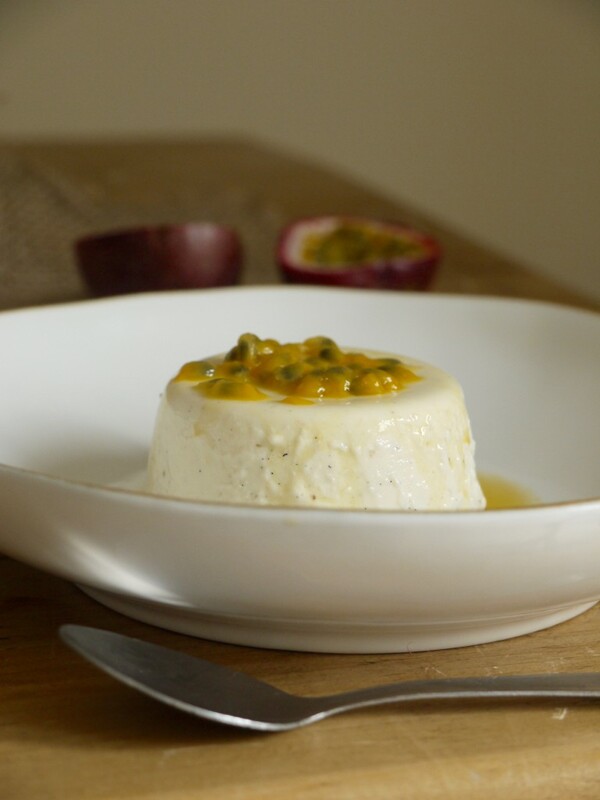 A simple, creamy dessert made with tangy Greek yoghurt and tart passion fruit. If you don't have passion fruit to hand try roasted rhubarb, strawberries or a handful of crushed walnuts and a drizzle of honey. Soak the gelatine leaves in a small bowl of water for 5 minutes. Meanwhile, combine the milk, cream, sugar, orange zest, vanilla pods and seeds in a medium saucepan and bring to the boil. Remove from the heat, squeeze the water out of the gelatine and stir into the warm milk mixture until dissolved. Very slowly whisk the warm mixture into the Greek yoghurt until smooth, then pass through a fine mesh sieve into a jug. Divide the mixture between six small glasses or ramekins, cover each with cling film and refrigerate for a minimum of five hours, or overnight. When ready to serve, run a sharp knife round the edge of one mould and dip into a bowl of just boiled water for 5 seconds. unmould onto a plate and repeat with the remaining puddings. 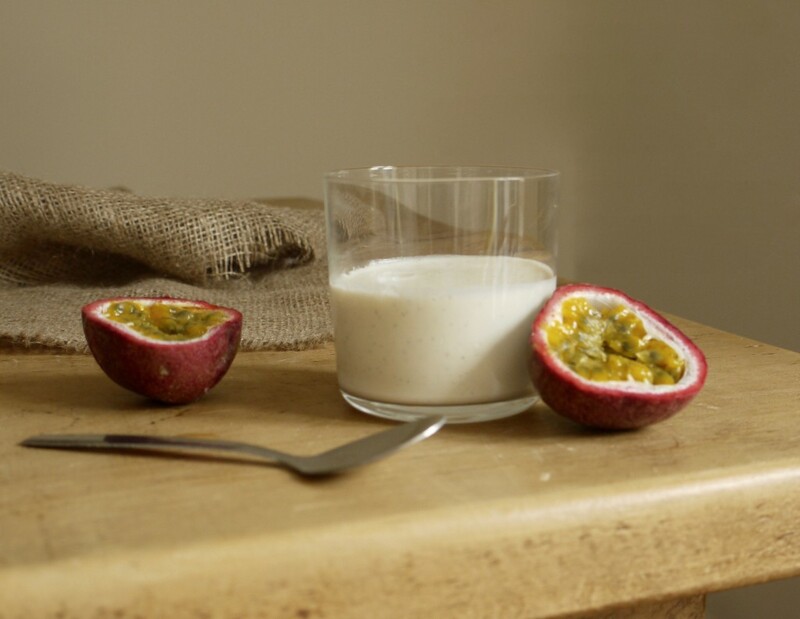 Spoon the passion fruit pulp evenly over the six puddings and serve. Oh Kate, this is a wonderful story, and an absolutely gorgeous piece of writing! I felt a big glow of happiness reading it. What a lovely story for Nino to grow up with. Sending you all the very best thoughts and wishes for Nino’s operation. I hope everything goes smoothly, and he is back home again where he belongs as soon as he possibly can be. Of course. 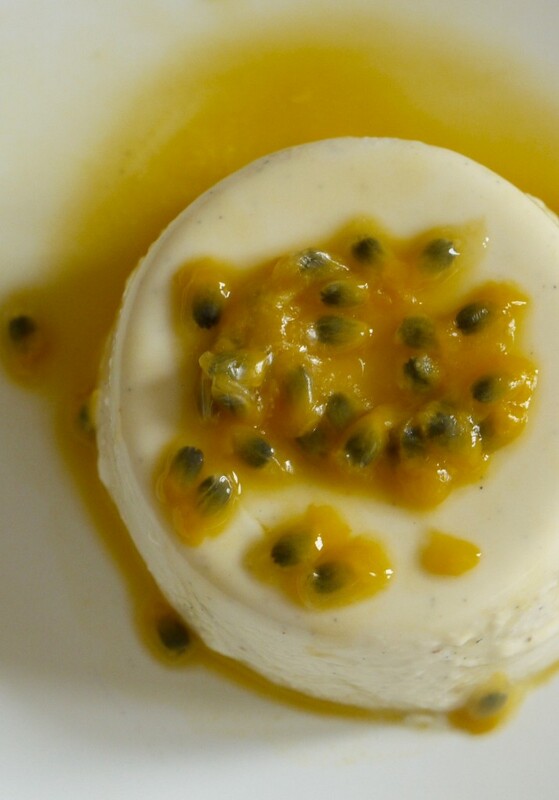 as usual, the panna cotta looks wonderful, too. How beautiful! And sending you and your little Nino all the support for the operation. This dessert looks lovely. Prayers too sent your way from across the Atlantic. Have you, or could you, use a vegetarian setting agent? 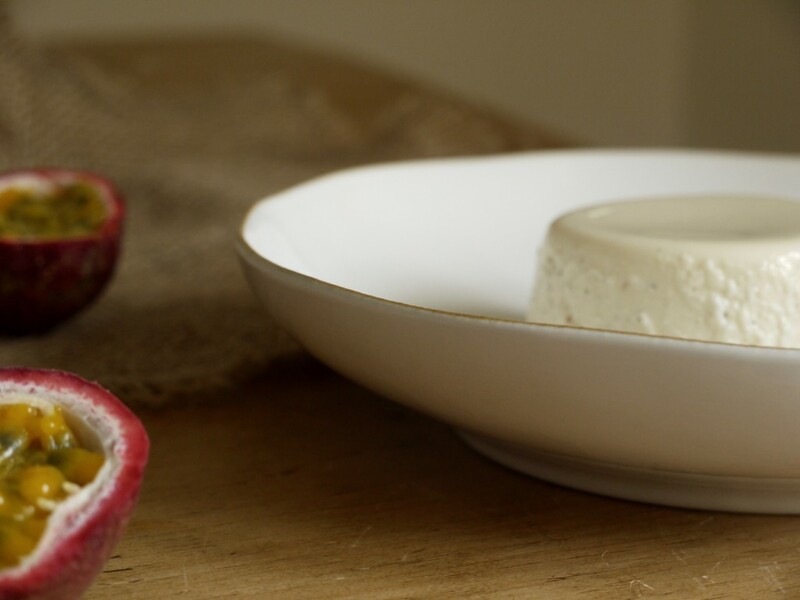 Yoghurt panna cotta is one I’d love to eat. The ubiquity of gelatine can be such a pain and disappointment. It is indeed! It yields a different texture sadly, but I’m sure I can figure it out. Thank you. An adorable, sweet story. Will be sending you tons of thoughts and positive energy on the 13th and following days. Please keep us posted, only if/when you can of course, since I know you will have so much else on your mind. A virtual hug from Italy. Lots of positive and lovely thoughts coming from all of us here. The best of luck with the op. Doctors are so amazing these days, I am sure it will be a great success. The great thing is, little Nino will not remember a thing about it. Kate – I wish you and your family best of luck for Nino’s surgery and recovery. I hope it all goes well. What a sweet story about his name – I always think it is so nice when children get a meaningful name and not just one that happened to sound nice and go with the child’s surname!